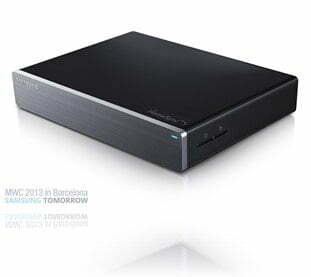 Samsung HomeSync, a 1TB Google TV set top box just announced! It’s interesting to see where Samsung will price the HomeSync, there’s growing competition in the Android set top box market, especially from low cost competitors like the MK808. If Samsung prices the HomeSync right it could also compete with the likes of the OUYA if Samsung picked an appropriate quad-core GPU. I’ll be watching MWC tomorrow to find out more! 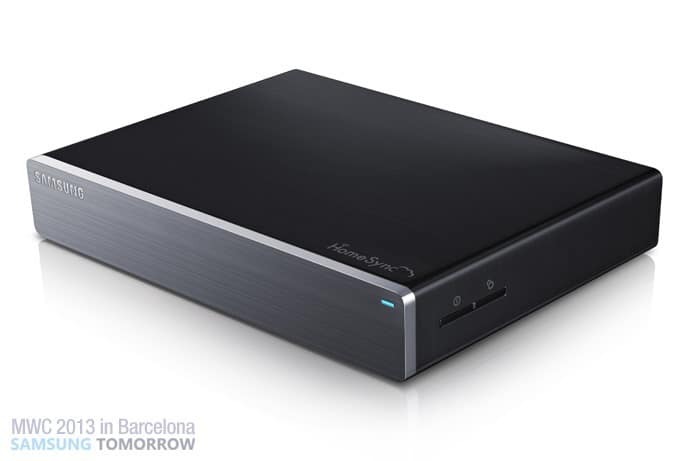 Barcelona, February 24, 2013 – Samsung Electronics Co, Ltd., a global leader in digital media and digital convergence technologies, today announced Samsung HomeSync, a home hub solution that a shared storage fit for a family, the best entertainment experience on a big screen TV, and a new way of enjoying your HDTV through a familiar and smarter Android user experience. HomeSync’s 1TB drive can help you sync to multiple devices, providing shared or private storage for all your content. It supports eight separate accounts to cover a whole family, and allows each user to upload and download content from multiple devices and instantly share with other family members. File encryption and user-specific ID and password ensure content in a user’s private area remains separate from the shared area in HomeSync. The HomeSync brings the best of Android gaming, movies, TV shows and streaming content direct into your living room. It allows you to stream content from your Galaxy device wirelessly to the TV – letting you watch, see and use all your home videos, photos and apps, and all at a full HD 1080p. Users can enjoy the full and familiar Android experience with HomeSync’s Jelly Bean media player and access to Play Store and all of your apps. HomeSync also enables new ways to interact with your content via the control modes enabled wirelessly on the phone. HomeSync will be available from April 2013 in select countries and continue to expand globally. This entry was tagged box, Google, homesync, Samsung, tv. Bookmark the permalink. ← This Changes Everything, Google Glass is Amazing! See through Glass’ Perspective in this Google Glass Video!